Iraqi central authorities in Baghdad have announced plans to go ahead with a controversial deal with British oil giant BP Plc. to revive the giant oilfield in disputed Kirkuk in a move that will spark anger in the Kurdish Region of Iraq, which is vying for control over the area with Baghdad. 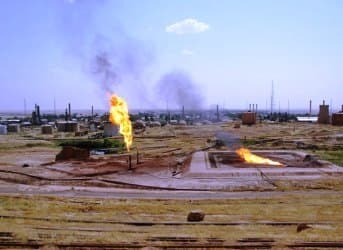 Baghdad signed the deal with BP in September, but the authorities in the Kurdistan Regional Government (KRG) say they remain opposed to the deal in Kirkuk, which lies in the disputed territory between the autonomous KRG and the rest of Iraq. According to Iraqi Oil Minister Abdelkarim al-Luaybi, output at Kirkuk has declined and the project with BP could see an increase in production to 500,000 barrels per day within three years. "The contract with the British company will be executed by treating the decline in oil production at Kirkuk oilfield, which has reached 230,000 barrels (per day), and the company will work on surveying the fields and sites of Kirkuk oilfield throughout the contract period," Luaybi told reporters during his visit to the oilfield. BP would conduct its work on the Baghdad-administered side of the border on the Baba and Avana geological formations. The third formation in the Kirkuk field, Khurmala, is controlled by the KRG and being developed by the Iraqi Kurdish KAR group. BP—which operates Iraq’s biggest oilfield, Rumaila--will reportedly spend $100 million to help develop Kirkuk. The KRG has continued to reiterate its opposition to the deal this month, warning that it will not provide security for operations if the project goes ahead. This is significant because the Kurds hold 26 seats in the Kirkuk provincial council and also occupy the main security and police positions. While an ongoing issue between Baghdad and Erbil, the question of Kirkuk has been revived due to a shift in the balance of power in the KRG following September elections that saw the Kurdistan Democratic Party (KDP) solidify more power in Erbil. The election results upset the power-sharing balance between the KDP and the second-largest party, the Patriotic Union of Kurdistan (PUK). This is now playing out in the disputed area of Kirkuk, where Kurdish governor Najimeldin Kareem is supporting the BP project against Erbil’s wishes. "We will provide complete support for BP to develop Kirkuk oilfield because it will generate a significant benefit for the province in relating to petrodollar revenues," Kareem said.